New Zealand’s Michael Campbell speaks to reporters in Hong Kong. Picture Jenny Matthews/www.golffile.ieRory McIlroy will bounce back quickly from his first missed cut since the US Open in June. The resilience of youth is on the 23-year old’s side, despite playing his last seven holes in six over and four-putting the last for a 72 to miss by three shots in his defence of the UBS Hong Kong Open. Yet 43-year old Michael Campbell admits he’s inspired by 40-something peers such as Open champion Ernie Els, Dane Thomas Bjorn, Jim Furyk and even Ireland’s Padraig Harrington as he bids to end his seven year victory drought. 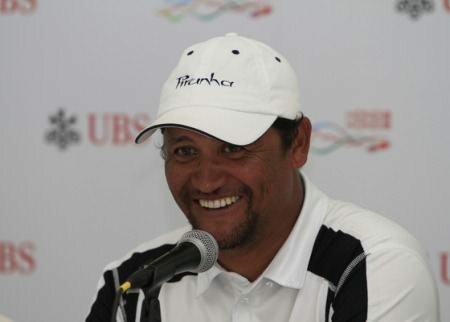 A six under 64, his lowest round for six years, left New Zealand’s 2005 US Open winner a stroke clear of Miguel Angel Jiménez and China’s Zhang Lian-wei – aged 48 and 47 respectively – and 40 year old Swede Fredrik Andersson Hed. Following his 2005 major breakthrough, Campbell made just four cuts in two years as he slid outside the top 1,000 on the Official World Golf Ranking. Still only 910th four months ago, he’s now up to 339th thanks largely to his third-place finish at the recent Portugal Masters. His confidence is on the rise and while he’s moved from England to Sydney to Switzerland and most recently to Marbella over the past few years and briefly considered quitting in 2008, he’s finally seeing results. “It’s been a gradual buildup the last three or four months, a few Top 15s,” Campbell said. “Portugal was a great boost to my confidence, and it shows this week. “The last couple days, it’s been pretty solid from tee‑to‑green. The whole short game has been pretty good, too. Rory McIlroy speaks to Caroline Wozniacki on his back nine in Hong Kong. Shortly afterwards he got on the bogey train and could get off. Picture Jenny Matthews/www.golffile.ie“So you can’t buy confidence, you just have to earn it, and I think I’ve earned it over last seven years since I haven’t won a golf tournament. I have been patient. “Yeah, there have been times where I wanted to throw it in, but what’s really inspired me over the last, particularly over the last four or five years, is seeing my friends around the same age bracket as me, 40‑plus club: The likes of Ernie winning his fourth major, Thomas Björn winning three times last year. “So not just me: Paul Lawrie, a wonderful last couple of years; Harrington, he’s 40 [sic] now; Jim Furyk winning the FedExCup. And the list goes on. So being 40 isn’t that bad playing golf. (Laughter). Seeing my friends win tournaments left, right and centre definitely inspired me to don’t give up and keep on playing. “I’m just happy to be in a position to have a chance. That’s why we play the game. That’s why I didn’t give up…. “There have been times where I wanted to throw it in. I remember I was back in Sydney (in 2008) said to myself ‘Okay, tonight is when I decide whether I’m going to give up the game or keep on playing’. Campbell could not deny that the absence of World No 1 McIlroy will make life easier this weekend. “Yeah, obviously it does,” Campbell said. “He is definitely the world’s best player for a reason. He’s a wonderful talent, and I’ve admired him ever since he turned pro. “I remember playing with him when he was 19 years old, four years ago, when he first turned pro and he was very impressive then. McIlroy secured the Race to Dubai last week and with it a money list double on both sides of the pond. He was in trouble after opening with a three over 73 but while he picked up four shots in his first 10 holes, he bogeyed three-putted three times as he bogeyed the fourth, fifth seventh and eighth before taking four putts for a double bogey six at his closing hole, the 10th. “I just got on a slide and couldn’t stop it,” McIlroy said. “Obviously not the week that I wanted. Padraig Harrington strides out in Hong Kong. Picture Jenny Matthews/www.golffile.ie“I was only four off the lead and thinking I could make a couple more and be right back in contention. Unfortunately it just went the other way. “I didn’t putt well last week and sort of got away with it. This week was the same, so I think a bit of putting practice is required in Dubai. “I think these couple of days off might actually do me good. It’ll give me a chance to rest. “I think if I was completely fresh I wouldn’t have been making the mistakes. Peter Lawrie was the only Irishman to make the cut after recording a second consecutive 68. But Padraig Harrington missed out for the second week in a row, failing by four shots despite a spectacular closing par that saw him skimming his ball across a lake and back onto dry land. His closing 75 featured just one birdie and six bogeys, including a run of three in a row from the 15th when he was fighting to make birdies and make the cut. The 41-year old hit just four fairways and failed to find any inspiration on the greens. As for Asian Tour regular Niall Turner, the Muskerry man shot a second round 71 to finish on five over, one shot ahead of Harrington. Hardly a consolation for a player who has serious tour aspirations. Jaded McIlroy vows: "I'll make sure I don't have such a stress like this next year"
Rory McIlroy tees off on the third in the second round of the UBS Hong Kong Open. Picture Jenny Matthews/GOLFFILETwo months after his now ex-management company claimed there was no danger of him suffering “burnout”, Rory McIlroy is running on fumes. Rory McIlroy goes wild in Hong Kong. Picture Jenny Matthews/www.golffile.ieRory McIlroy is almost as well known for snatching defeat from the jaws of victory as he is for his stunning victory romps. But after going stark raving bonkers by holing a bunker shot on the 72nd hole to win the UBS Hong Kong Open by two shots to revive the seemingly moribund Race to Dubai, he killed about three birds with one swing of his sand wedge. Padraig Harrington, sporting his ‘Movember’ moustache, and Race to Dubai winner Rory McIlroy during The 2012 UBS Hong Kong Open Photo Call at The Peak Tower in Hong Kong. (Photo by Ian Walton/Getty Images)While Rory McIlroy is on top of the world after closing out his first European money title, Padraig Harrington admits he was driven to distraction as he missed the cut for the third year in a row in Singapore. Peter Lawrie hits his approach on the par-five third at Fanling. Picture by Jenny Matthews/www.golffile.ieAs a lethargic Rory McIlroy slipped nine shots off the pace in the UBS Hong Kong Open, Peter Lawrie opened with a two under 68 to keep his Race to Dubai rivals in his sights at Fanling.